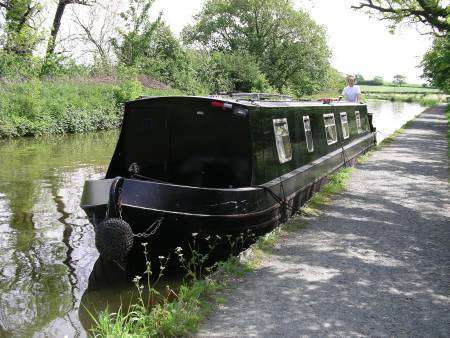 The excited crew left Alan's House in Neil's car just after 9am, travelling the scenic route through the Lancashire Hills to arrive at "The Owd Nell's" canalside pub, where they quickly located to their Narrowboat for the week. Although the boat showed no name, the keys fitted and the engine started, making them satisfied that the right boat had been selected. As the predominate colour of the boat was black, it was considered that it must be some form of Stealth boat, which is how the crew will now refer to her. Some time was spent checking out the facilities of the Stealth Boat, undertaking necessary tasks, such as checking the Reed Hatch and refilling the Prop shaft greaser. The Ships log was consulted, showing the last occupants of the boat to be 5 females and their recorded antics caused the crew much amusement. Lunch was taken at the Owd Nell's, of beefburger and chips, with 2 pints of very acceptable Black Sheep Ale. After lunch a shopping expedition was made to Booths supermarket in Garstang, where a considerable quantity of wholesome provisions were procured. 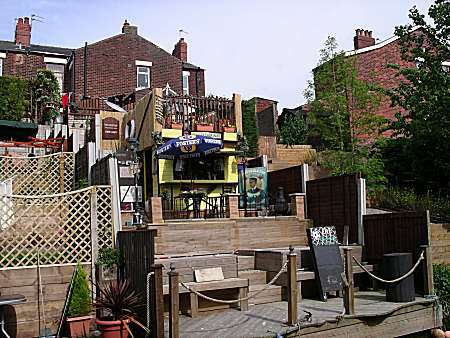 The crew returned to the Owd Nell's to watch the second half of the Cup Final on the large screen television and consume further ale. Afterwards the crew took an hour's walk along the canal past Bridge 49, a distance of some 3½ miles and then prepared for dinner at the Owd Nell's, which was thoroughly enjoyed by all. Afterwards returned for cheese and biscuits on board. It was considered that an early start would be made the following day to arrive at Preston to investigate the new Ribble Link canal. Up early and away by 8am after porridge prepared by Neil, together with engine oil checking and prop shaft greasing. Found the boat to be excellent to control and the steering position most comfortable. 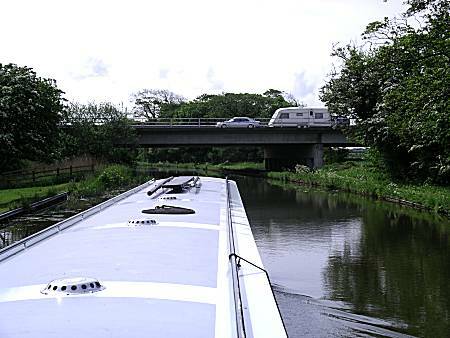 Gently cruised down to Bridge 32, where the crew stopped to fill with water and enjoy a fried breakfast prepared by Ron. Arrived to moor just after the Ribble Link junction and hurriedly started the walk down the Millennium canal. 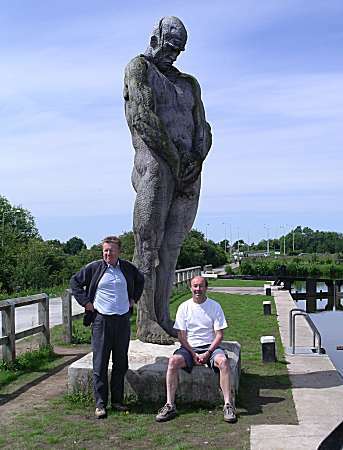 Admired the magnificent statue by the first of the staircase locks and then walked the 2½ miles to just after Lock 8 where the footpath stopped. The crew were surprised by the narrow winding nature of this new canal link, which had obviously followed the path of a small stream. After arriving back after the 1½ hour walk, the crew treated themselves to a splendid lunch of Pork Pie, Turkey slices, pickles, including pickled onions. 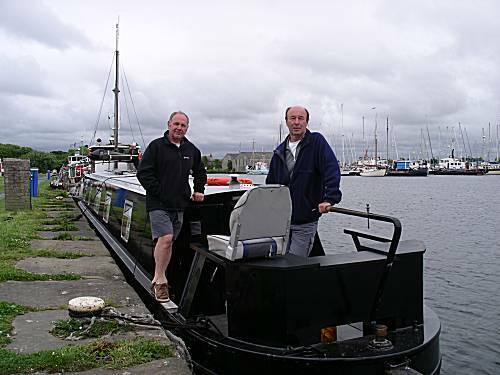 The narrowboat then continued its journey to the end of the canal in Preston, where Neil managed an excellent turn in the entrance to a small boatyard, with only minor help by Alan with a boat pole. The narrowboat was carefully negotiated back to Salwick, Bridge 26 for an evening at the "Hand & Dagger", where an excellent dinner (Except Ron - Soggy Batter) was enjoyed by all. A total of 6 pints of London Pride were enjoyed, interrupted by an hour's walk. Ron proved to be the Pool champion, mainly due to the bad advice given to Alan. Cheese and biscuits were enjoyed back on board, before retiring at midnight. 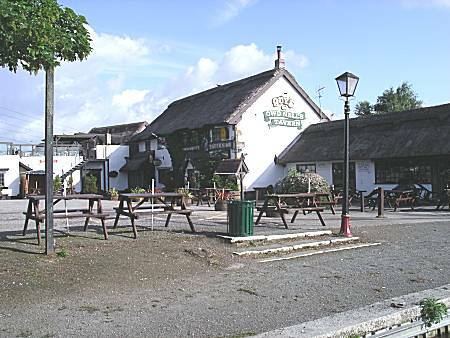 The intention of the crew was to travel today up to Galgate and take the Glasson Dock spur to stay the night at "The Stork" in Conder Green. The excited crew were up at 7-15 and underway at 8-30 after porridge prepared by Neil, stopping for an excellent cooked breakfast, prepared again by Ron just after Swillbrook. A stop was made to fill with water and carry out routine maintenance in the engine department. As the weather soon became very hot both Neil and Alan found it necessary to remove their tops and enjoy the full power of the sun. 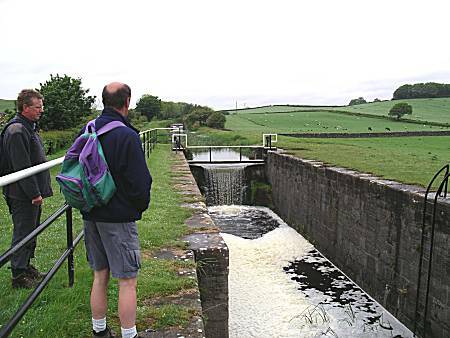 After passing the starting point at Bilsborrow, the crew took delight in admiring the two Aqueducts built by John Rennie in 1797 and moored at Garstang to take the steps down to investigate the Wyre Aqueduct further. An excursion into Garstang town again found the crew at the Booths supermarket, where further supplies of cheese, eggs, bread and crackers were secured. The Old Tithe Barn, adjacent to the canal basin, was visited, where the crew found the Jennings Cumberland Ale, much to their liking. 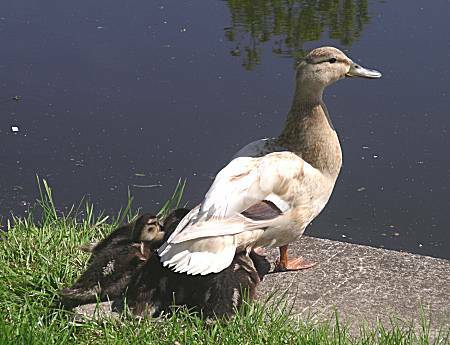 After the third pint they decided to abandon any attempt to reach their planned destination for the day and agreed to stay in Garstang for the night. 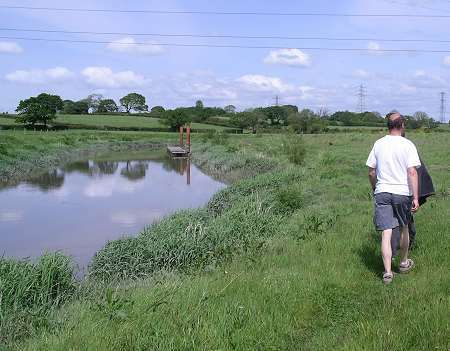 After moving the narrowboat closer to the pub, Ron and Neil left on an expedition to follow the River Wyre towards its source, leaving Alan with his fishing rod. 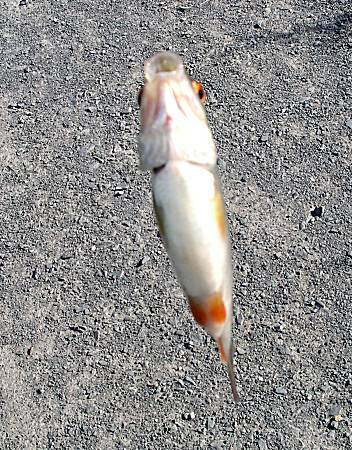 By the time Neil and Ron had returned, Alan had landed two Roach of an unusual size. Neil had located a Chinese restaurant in the town and the crew found the thought irresistible. A banquet was purchased together with Thwaites smooth ale which were enjoyed by all. The return trip the boat was interrupted by a detour to the Th' Owd Tithe Barn, for a further pint of Cumberland Ale, where under the patio heaters, the crew watched the ducks fighting. The crew were unable to manage cheese and biscuits and retired at 11-45 after coffee back on board the boat. In anticipation of a long and busy day the crew rose at an early hour and after routine engine maintenance, departed after the statutory porridge at 7-45am. Breakfast, prepared by Alan, including scrambled egg, was consumed "on the move" in relays, due to the lack of suitable mooring places, at around 10-15am. Out of character, Neil took a responsible view and carried out some forward planning, attempting to find suitable locations for refuelling and pumping out. 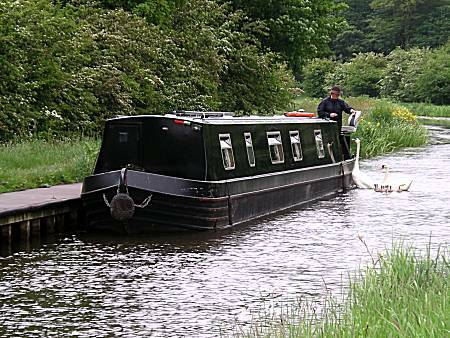 After several telephone calls to suitable boatyards the realisation struck the crew that there are only two locations for pump-out on the entire Lancaster Canal. These were at Galgate and Lancaster. The route was therefore agreed to call at Galgate to investigate the facilities and travel onward through Lancaster to overnight at Hest Bank, thus allowing time for an extended walk along the coast. 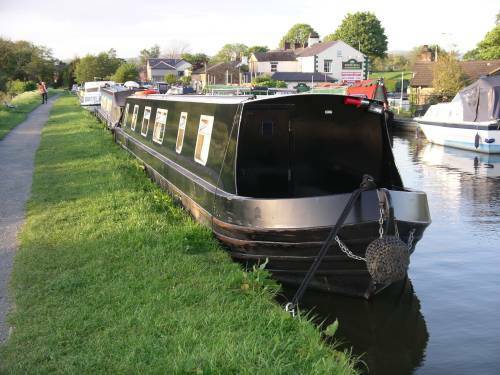 Tewitfield would be visited the following day with a walk up the abandoned section of the canal and overnighting at Lancaster and Thursday could incorporate the Glasson Dock branch with a view to reach Garstang again by nightfall. The Galgate facilities were visited and looked good, but the "Do it Yourself" pump out facilities were broken at the time, but were allegedly due to be repaired later that day. The crew purchased a £10 pump-out ticket and planned to visit on their return the following day. 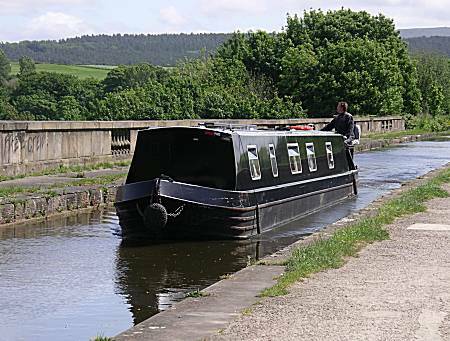 The Stealth narrowboat travelled through Lancaster City centre and over the giant Lune Aqueduct, accredited to John Rennie, before gently drawing into her moorings at Hest Bank at 2-15pm. After lunch of ham roll, salad, pickled onions and pork pie, the inquisitive crew left to investigate Hest Bank. They expertly and rapidly located "The Hest Bank Hotel" public house, where the menu and Timothy Taylors Ale met with their approval for an evening visit. 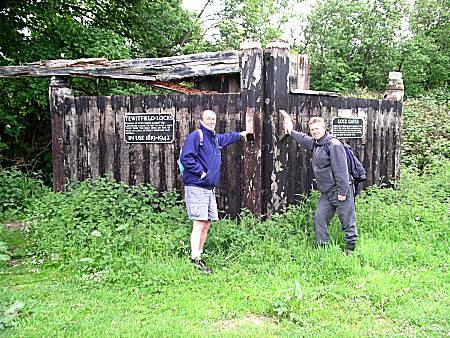 Both Ron and Alan recalled visiting Hest Bank on "The January Jollies" walk, which they believed was completed in 1996. 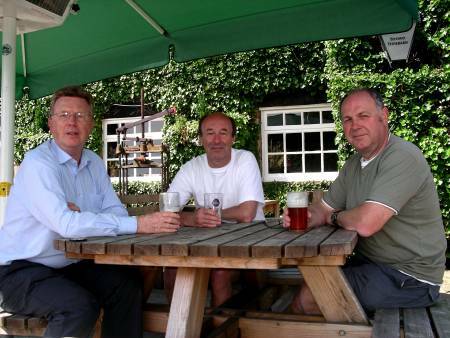 They also recalled visiting a pub adjacent to the canal on that walk and were determined to relive their memories. 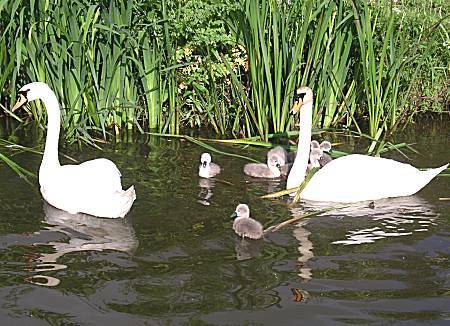 After a long walk down the canal the pub was found, which had been extended considerably since their last visit. One swift pint of Black Sheep ale was enjoyed in the beer garden before the crew headed down to the sea to join the Lancashire Coastal Path back to Hest Bank, stopping briefly to watch the trains on the West Coast main line as they crossed over at a level crossing. The crew showered and prepared to visit the "Hest Bank" for dinner and Timothy Taylors. Dinner of Fish & Chips (Lamb - Ron), together with three pints were enjoyed in the busy pub. Afterwards the magnetic attraction of the level crossing enticed the crew where two freight trains and one passenger train were witnessed passing northwards. Afterwards the crew enjoyed a walk along the sea shore. The crew again rose early, leaving their moorings at 7-45am, after porridge. The journey in the heavy drizzle up to Tewitfield was accomplished in good time arriving at 11-20am, where Neil turned the narrowboat at canal end, whilst Ron prepared an egg and bacon breakfast. This was enjoyed after mooring and then the crew prepared themselves for exploring the continuing un-navigable section of the canal which heads northward towards Kendal. This was officially closed in 1968 on completion of the adjacent M6 motorway. 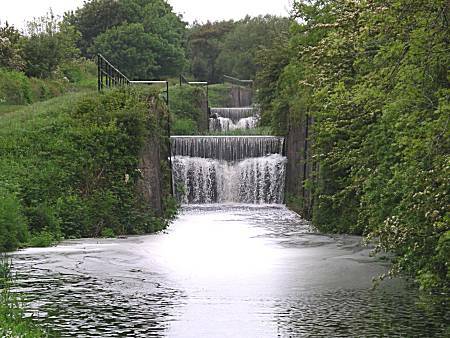 An embankment for a motorway bridge now divides the canal and the flight of 8 disused locks had been converted into weirs by removal of the lock gates and building a wall at the top gate position. 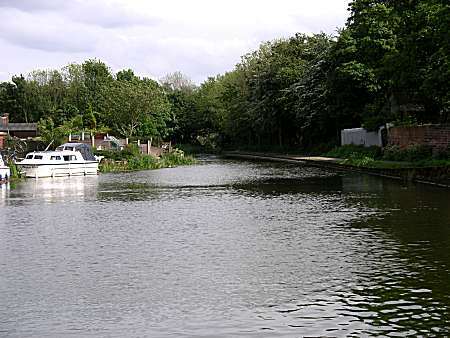 The crew were surprised at the condition of the remaining canal and felt that restoration could be possible, until on venturing further up the canal they realised that the motorway was built directly across the path of the canal. They continued for another 3 miles, before turning to return to the boat having much enjoyed their 2 hour walk. Tewitfield lock gates positioned for tourists to marvel at after all these years. They immediately set off for the estimated 5 hour journey to their planned destination for the evening at Lancaster. A lunch stop was made at Carnforth, where the last of the rolls and pork pie were consumed. A visit to the nearby Tesco enabled stocks of Rolls, Bacon, Pork Pie, milk and other items to be replenished, except tea spoons. As Tesco did not sell tea spoons, Neil was despatched on a tea spoon hunting expedition, but returned empty handed!! It was noted that the nearby BP garage sold bottled gas and therefore Alan and Ron removed the nearly empty cylinder and purchased a replacement 19Kg bottle. The weight of the gas made the return journey back to the boat somewhat taxing as the weight was fxxxing heavy. 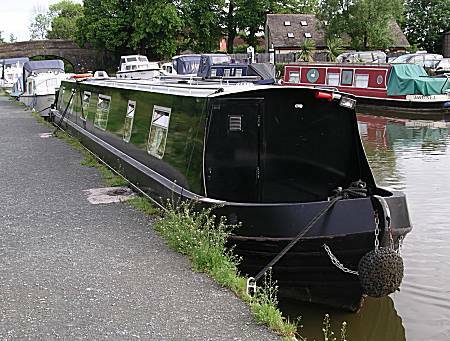 The narrowboat was then carefully negotiated across the canal basin to a boatyard opposite, where £60-10 of diesel was purchased. The skilful reversing manoeuvre carried out by Ron was much admired by the remainder of the crew and spectators. 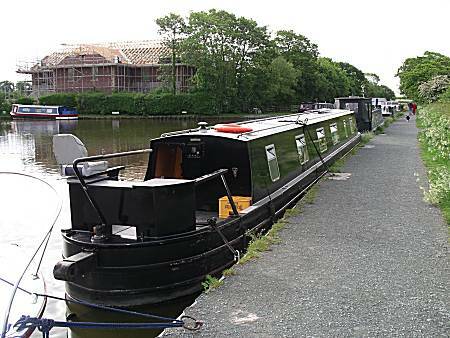 The journey on to Lancaster continued where they moored adjacent to the Water Witch pub. The crew then set off in search of food and drink, asking a policeman where he would recommend. They were directed to the Sir Richard Owen, a Wetherspoon's pub, where steaks (except Alan) were enjoyed. A total of five pints of Abbot Ale were consumed (except Ron) whilst watching the Liverpool v AC Milan cup final on the large screen TVs. 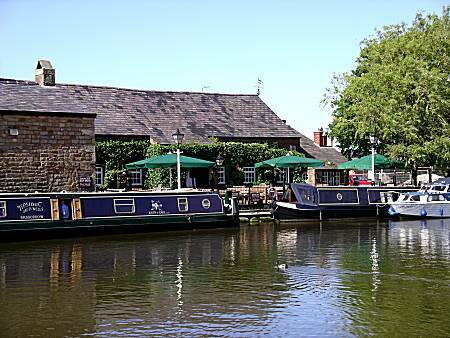 The spirit of the crew was much lifted by the views within the pub during the evening and returned to the narrowboat in good humour to enjoy coffee, cheese and biscuits before retiring at 12-15, in anticipation of the busy day ahead. The crew rose at an even earlier hour than normal casting off after porridge and engine maintenance at 7-40am. An uneventful gentle cruise took the crew down to Galgate where they were anticipating the excitement of a "Do-it-Yourself" pump-out. However, their spirits were much dampened, when an "Out of Order" notice was seen on the pump-out machine door and the realisation struck the crew that they might no be able to accomplish this task before the holiday end. 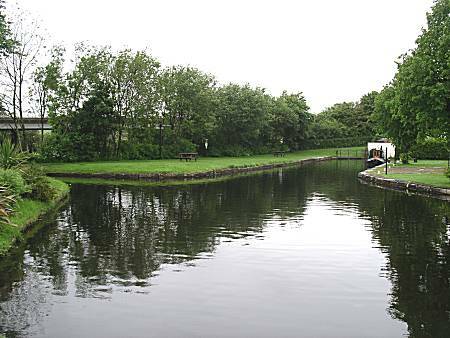 Previous telephone calls had indicated that this facility was not available at either Garstang or the Moons Bridge boatyard near Bilsborrow. The crew were horrified at the thought of this!!!! However, the brave lads put their disappointment behind them and prepared for the transition of the Glasson Branch with its flight of large locks. The sharp turn into the narrow entrance was accomplished with much skill, where the first of the locks was seen immediately ahead. 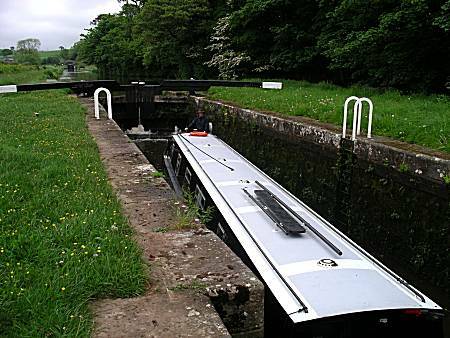 Although the locks were of an unusual design, the adaptable crew fell into their "well oiled" lock routine with ease and the giant locks, which had first to be filled before entering, proved natural to the team. At lock 3, a elderly couple in a cruiser waved the narrowboat past, not wishing to hinder their excellent progress. As the narrowboat pulled into Glasson Yacht Basin at lunchtime, Ron started preparation of a very late fried breakfast of egg, bacon and sausage, with a little toast. A mooring location was selected and Alan carried out a successful single combined turning and mooring manoeuvre, much to the surprise of both himself and the other members of the crew. The Stealth narrowboat gently slipped out of its moorings, at the rather uninspiring Glasson Dock, around 12-45pm to start the ascent of the Glasson locks, reaching the Lancaster Canal at 2-30pm. The journey then continued to their planned destination for the evening at Garstang, consuming Ham Rolls, Pork Pie and orange juice, with tomatoes, prepared by Neil on-route, and consumed in shifts. On arriving at Garstang a very successful shopping expedition to Somerfield was accomplished, securing tea spoons, bread knife and wine, together with nuts. A swift visit was made to the Wheatsheaf to investigate the evening meal menu. However, both the menu and the beer (Copper Dragon "Golden") proved disappointing and therefore they decided to check out the Th'Owd Tithe Barn's menu, which met with the crew criteria. Cleaning of the narrowboat both internally and externally then commenced with gusto and J Cloths. The crews spirits were much lifted by the comments of a passing boater, who enquired as to whether the boat was new. After showering the crew hurried to their evening destination for beer (4 pints Cumberland Ale) and 16 oz Gammon Steaks, except Neil (healthy Salmon pasta dish). The exertions of the day caused the crew much tiredness and therefore they retired to the boat at 10-30 for much cheese, coffee and an early night. The plan for tomorrow is to rise early (Not too early) and cruise down to Bilsborrow, where the outstanding egg, bacon, sausage and toast, with orange juice, will be enjoyed. After a final clean-up the trusted narrowboat "Stealth" will be locked and sealed ready for Cran's (The Owner) two month expedition of the remainder of England. The crew realising that it was the end of their holiday, rose later than normal and Neil prepared his excellent porridge (best yet). After the crew gathered and packed their belongings, the boat left its moorings at the start of its two hour journey back to the starting point at Bilsborrow. Just before arrival, Alan prepared the final breakfast using up the remaining sausages, bacon and scrambled egg, together with the last of the bread. An opportunity was made to call at the BWB services opposite the destination, where breakfast was consumed whilst the water tank was slowly filled (To stop blow-backs). The remainder of the boat cleaning duties were completed and Alan then took the boat across the canal where it was moored in a similar position to where it had been collected 6 days earlier. They transported their bags back to Neil's car, whilst Alan made a final check of the reed hatch and the messy job of refilling the prop shaft greaser. Ron checked the coolant level, which had not altered since it was last topped up. The windows, were closed, curtains drawn and the batteries isolated, leaving the boat ready for its next occupants. The satisfied and very appreciative crew left Bilsborrow, programming Neil's new Tom Tom GPS navigation system towards Cran's house to return the boat keys. The crew enjoyed a coffee with Cran, whist they recalled the salient points of their expedition. They also learned that the narrowboat did indeed have a name, which is "S'mine Too". Disobeying Tom Tom's directions towards the M62, Neil returned to the Harrogate area, via the Pork Pie shop in Earby, where Ron secured a Stand Pie for the following day's walking in the Yorkshire Dales. The crew arrived safely at their homes to reflect on a successful and very enjoyable week's cruising.